EPTC partners with Macmillan BOLESWA publishers who have given a variety of reading material, which covers not just technical subjects but accounting and other fields. 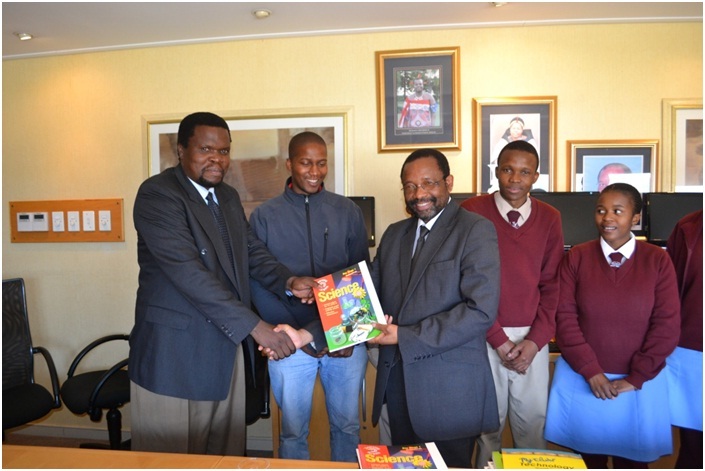 Mr. Dlamini, St. Francis' Principal receiving books from the Acting Managing Director Amon Dlamini. Over the 10 years we have been very happy to work charitable non-governmental organisations such as World Vision, Red Cross, Salvation Army, SOS, Swaziland Epilepsy Organisation, Hope House, Hospice at Home, Lindani Foundation. These are communities whose work extends to food production projects for communities, skills development, clinic services and health awareness, care for terminal patients, provision of shelter for the elderly and disabled and many other fundamental human needs. For eight weeks running, EPTC staff, NGOs and PLS teams all descend on the identified needy communities and do physical work. Work typically entails gardening, construction of piggery shed, construction of houses, working in hospitals and hospices. Even outside the annual SwaziTelecom Charity, EPTC continues to express its acceptance of the social responsibility it has to communities. Several initiatives, some of which resonate with our core business as a technology company have been undertaken. The Corporation has always been seen in the forefront, making computer donations to schools, encouraging the youth to take up ICT careers and participating in initiatives that promote education. This has seen the Corporation partnering with organisations such as Boleswa MacMillan. All these activities are in line with the Corporation's mandate of making communication and technology accessible to all. In fact all our products and services reflect our acknowledgement of this mandate. Our latest technologies have ensured that telecommunications is better accessible and cheaper to use.